FILE - In this photo made from a Sept. 16, 2016, police video, Terence Crutcher, left, with his arms up, is pursued by police officers as he walks next to his stalled SUV moments before he was shot and killed by one of the officers in Tulsa, Okla.
broken down and blocked a road. Officer Betty Shelby, 42, was charged on Thursday for killing Terence Crutcher, 40, and faces at least four years in prison if she is convicted in the case that has stoked simmering anger among those who see racial bias in U.S. policing. Crutcher died of a penetrating gunshot wound to the chest, Oklahoma medical examiners said, adding that a toxicology report has not yet been completed. The Rev. 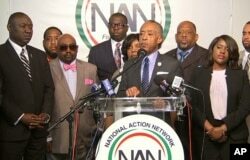 Al Sharpton, center, speaks to the media at the National Action Center in New York, Sept. 21, 2016 about the shooting death of Terence Crutcher in Tulsa, Oklahoma, on Sept. 16, 2016. Shelby is scheduled for an initial court appearance on Sept. 30. Her attorney told local media she is receiving death threats. In a separate incident, Charlotte, North Carolina, has seen three nights of protests, some of them violent, after the fatal shooting Tuesday of a black man by police. Police videos have not been released in this case so as not to compromise the investigation, authorities said. The incidents are the latest to stir passions over the police use of force against black men. It has provoked broad debate on race and justice in the United States and given rise to the Black Lives Matter movement. In two videos provided by Tulsa police on Monday, Crutcher can be seen with his hands in the air shortly before he was shot last Friday. According to an arrest affidavit, Shelby escalated the situation and overreacted. She was responding to a separate call for a domestic disturbance when she came upon Crutcher in the road. Shelby told investigators Crutcher did not comply with her instructions and "that she was in fear for her life and thought Crutcher was going to kill her," according to the arrest affidavit. According to Tulsa police, Crutcher was unarmed and there was no weapon in the vehicle. In a bid for transparency, they released the videos, one of which was taken from a police helicopter and the other from a dashboard camera in a patrol car. "She became emotionally involved to the point that she overreacted," the affidavit said. In Kansas City, Missouri, a police officer was being investigated for potential misconduct after a message appeared on his Facebook page praising Shelby for her "good shot," the department said on Twitter, without identifying the officer. What Does a State of Emergency Mean for Charlotte?